Granville Island is readily accessible by public transit, car, ferry, bike or on foot. by CAR – FREE PARKING is available all week long under Burrard Bridge. Enter at the foot of Fir Street at West 1st Avenue and look for the signs. Thank you to the Squamish Nation for their generous support. 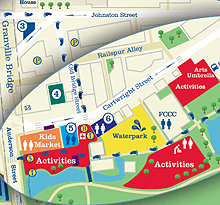 Note: it is a 20-minute kid’s pace walk from the parking lot to Granville Island, so make sure you arrive at least 45 minutes prior to your show to allow enough time to get there. For directions to parking and the festival site, please see this Google Map. LIMITED PAID PARKING is available at the entrance off Old Bridge Street. 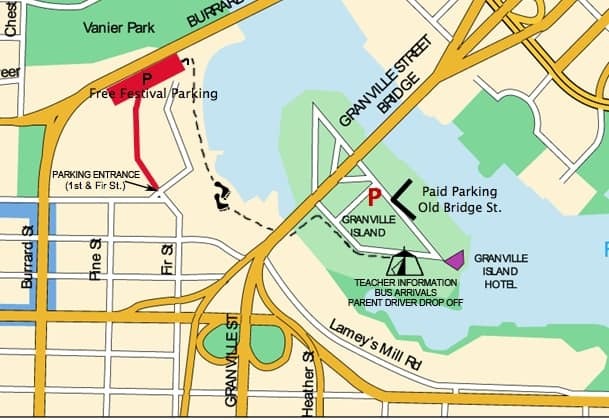 There are pay parking lots on Granville Island (click to see map). 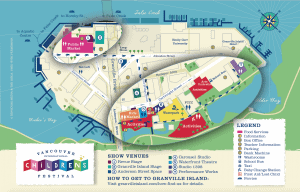 There is some free parking on the Island but it is limited to 1 to 3 hours and starting Saturday, June 1, 2019 is only available before 11am and after 6pm. by CAR SHARE – Both Evo Car Share and Car2Go parking on Granville Island. by TRANSIT – Catch the #50 bus direct to Granville Island. Service is every 15 minutes from the Waterfront or Olympic Village Skytrain stations. Visit Translink for details. by BICYCLE – a scenic bike path runs along the shore of False Creek and there’s plenty of bike parking on Granville Island. There’s a free bike valet at Ocean Art Works provided by Granville Island. The valet is available 7 days a week from 10am until 7:30pm.